One of the driving forces of the evangelical contemporary Christian movement, Willow Creek Community Church, was established in 1975. On October 18, the church celebrated its 40th anniversary before more than 20,000 worshippers at the United Center in Chicago. The two-hour event featured in-the-round staging, a high-powered contemporary praise band, video presentations, and words from Willow Creek co-founder and senior pastor Bill Hybels as well as other members of the team. To coordinate the audio for this massive event, the church combined the expertise of current and former staff members. Nathan Miller of Miller Audio Services Incorporated, Brownsburg, Indiana, a 12-year veteran of Willow Creek, was brought in as the audio lead, working with production manager Todd Elliot of Fusion Productions, who served at the church for about ten years. To realize the audio aspects of the church’s production vision, two major audio suppliers were required: T.C. Furlong Inc. of suburban Lake Forest for backline, including microphones and wireless systems, Nashville-based Morris Light and Sound for the PA system, and Yamaha Commercial Audio Systems for the PM10 consoles. Much like the weekly services at Willow Creek’s home venue in north suburban South Barrington, the 40th anniversary event relied almost exclusively on Shure microphones and wireless systems. According to Nathan Miller, all the wireless systems were Shure, as were all hardwired mics, save two. “It was primarily a Shure stage, just like it is at Willow Creek every Sunday,” he says. Wireless needs for this event would rival any major rock tour. Eight channels of Shure Axient® Wireless Management Network with premium KSM9 capsules covered the most important vocal inputs. 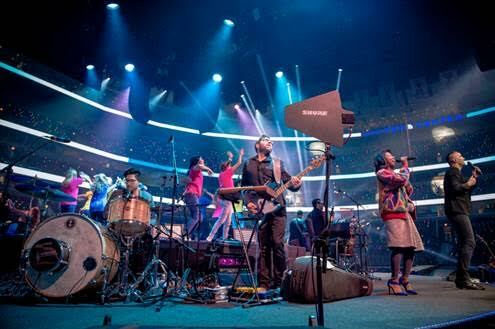 For the key instrument channels of worship team leaders Matt Lundgren and Brandon Grissom, Miller selected the extended, linear response of the quad-channel ULX-D® Digital Wireless. All other RF microphone needs were covered by 20 channels of Shure UHF-R® Wireless. All wireless audio channels were networked together. Stage monitoring was also an all-Shure affair, mixed by touring monitor engineer Matt “Sators” Satorius, who is also a former Willow Creek staff engineer. Touring engineer Matt Manix was responsible for RF, which included 12 channels each of Shure PSM® 1000 and PSM® 900 systems, with one channel of the PSM® 900 dedicated to interruptible foldback (IFB). Including intercoms, a total of almost 100 RF channels were in play. The team used Shure tools for frequency coordination and system monitoring as well, using Axient Spectrum Manager and Wireless Workbench® software. In preparation for the event, Willow Creek rented the 10,000-seat Convocation Center at Northern Illinois University, intending a full rehearsal with all technical elements in place. Unfortunately, that rehearsal was cut short by a campus-wide power outage, lending an air of uncertainty to the United Center show. 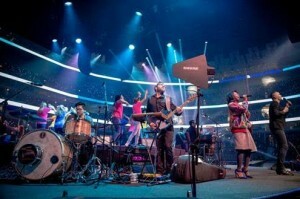 Another layer of complexity involved the band, which was expanded with dual rhythm sections to accommodate gospel and contemporary musical approaches. Like the vocal microphones, the production team also relied on Shure for miking the praise band’s instruments. The 60-instrument inputs included Beta 91A and Beta 52A® on kick drums, SM57 on snare top, and KSM141 for snare bottom and hi-hats. The Beta 98AMP miniature condenser was used for toms, while the KSM32 captured overhead cymbals. Additional percussion was captured through a combination of SM57 and KSM141 mics. The soon-to-be released Yamaha PM10 consoles were outfitted with the classic SM58S as their talkback mics.